Here is a diplay of what Naomi bought for herself, using her hard-earned allowance. A practice these days that at nine years old, we are encouraging very much. It's amazing to see her not going crazy about every single thing in the store, but choosing carefully what she really likes and what she can afford. It feels so good not to have to deal with the constant "Mom, can I have this?" anymore... 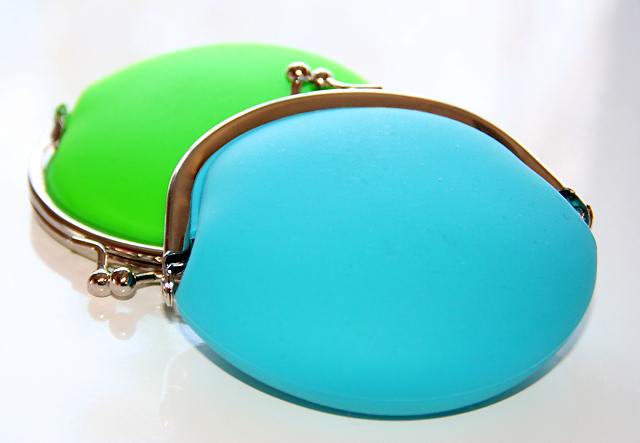 Neon Coin Purses made the cut, because "a girl always needs to have her coins in a safe, fashionable place". 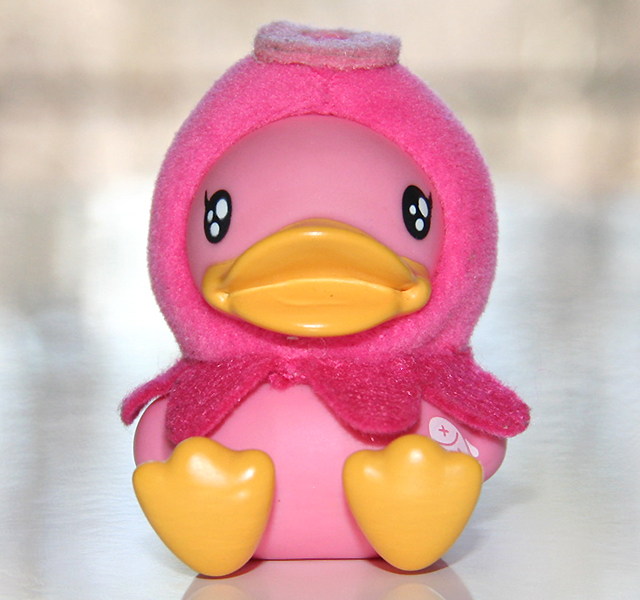 Do you also enjoy Girly Girls' Day with your little one? ...What activities do you include? ... Leave a comment. I'd love to know. 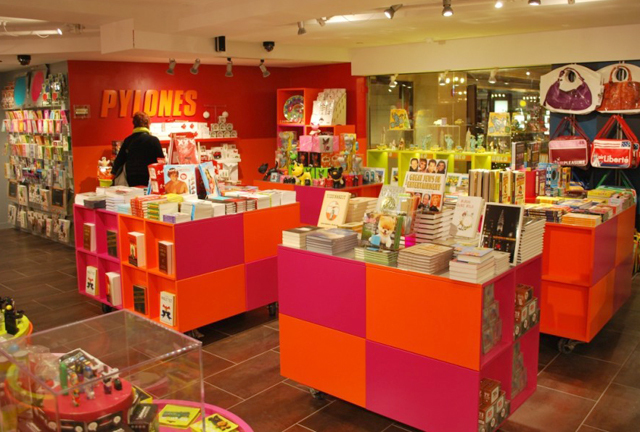 More details about Pylones in NYC available here. Certainly, this has been the mildest winter ever in New York. Just yesterday, still in February, the thermometer reached fifty seven degrees, the air smelled of spring, and I even saw tulips already growing some leaves. 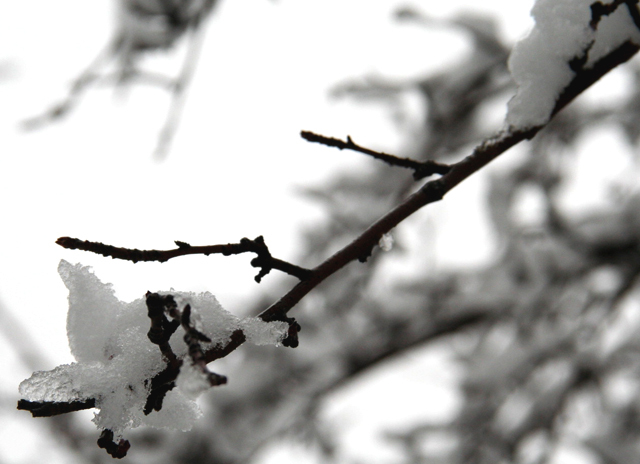 A winter without snow. A winter that sarcastically, showed up too early with a terrible storm right before Halloween, last year... And now, when we thought that winter was over, it did it again. Last night, my husband and I enjoyed the nice temperature outside while we talked about our day. There was no sign of snow. However, a phone call a 4:50am announcing a school two-hour delay due to inclement weather, forced me to get up and look out, so I could understand what was going on. It is all melting fast though. It also brings a beautiful picture to look at for a few days, a gorgeous combination of so many tones of white and gray... Oh, well!! 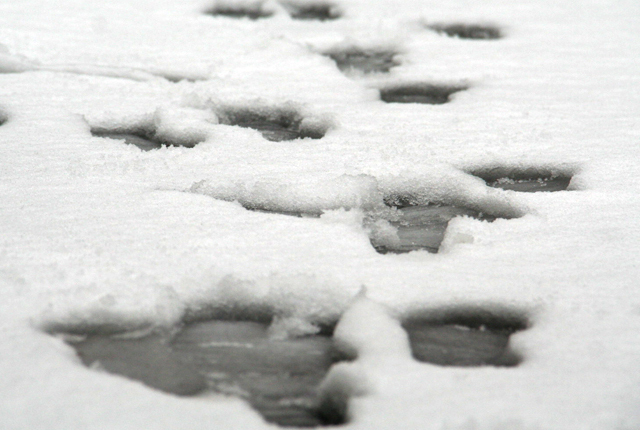 I guess it isn't time to sing in the rain yet, but to step on puddles of slush, instead. Whatever the weather is in your corner of the world, I hope you have a great weekend. Indoors, outdoors, just make it fun!! With the mild winter we've had in New York this year, it looks like everyone is so ready to dump the heavy coat and forget about it, once and for all. We know, we feel it, the signs are right there- no snow, longer days... sure, spring is just around the corner and with it, a whole different set of colors starts to take place. Soon, a new palette will start to populate the streets. This year, the color gray continues its reign... For the coming season, we see gray combined with touches of vibrant colors everywhere, in home decor and accessories, grown-up clothes and of course, children's fashion too. 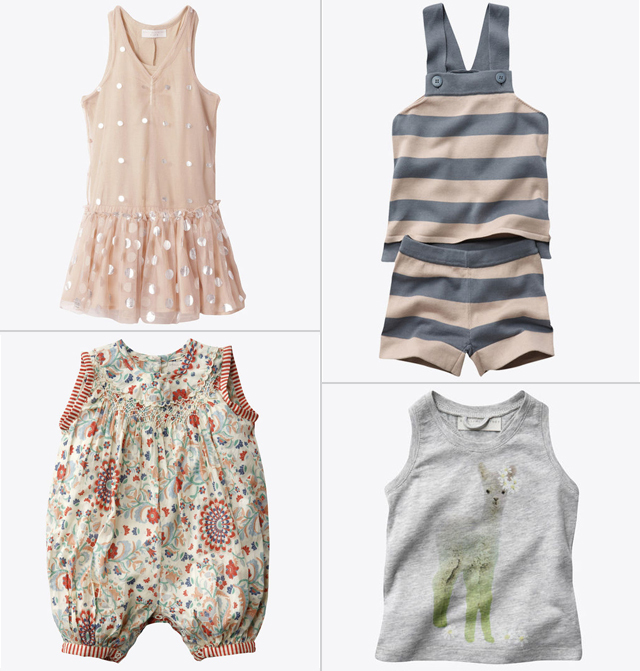 Stella McCartney's spring-summer collection for kids just launched and we are loving the stylish outfits for the littlest ones, especially the pairing of the color gray with delicate tones of light pink and blue for a softer spring look, or the vibrant combination of gray and sunshine yellow for the warm summer months. What do you think? Pretty and fun... right? Our highlights from this collection? The feminine Pink Bell dress with its silver printed dots and Easter outfit appeal. Also, the August Jumpsuit with its fine stitching and intricate print. Completing our list, the creative graphic designs on t-shirts and all-in-one suits featuring a Cowboy Banana, a sweet baby llama and some version of an Ugly Doll-cat-monster... really cute!! Want some additional goodness? Most of the items in this collection are made of 100% organic cotton. 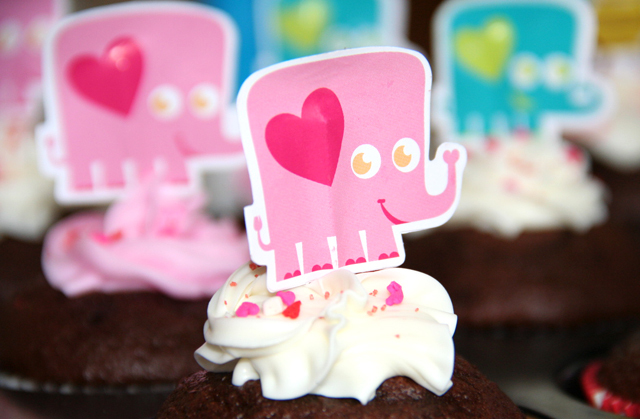 On Valentine's Day, as I baked cupcakes for Zoe's party at school, I gathered my thoughts about this date and made a quick mental chronology... It was eleven years ago, right on Valentine's Day when Craig popped the question "will you marry me?" and so, we got engaged and later on, married. Our two girls were born and now that they are nine and five years old, we finally felt it was the right time to share with them a dream we had kept for so long. Craig and I met in New York City at Lumi, an Italian, Upper East Side restaurant that will always bring the sweetest memories of the beginning of our relationship, the times when we used to talk endlessly about our future and what "life with kids" would be. As a Valentine's Day celebration, we decided to make our dream come true. We went back to Lumi, not as a couple, but as a family and introduced our daughters to the place where mom and dad fell crazily in love. I have to say, the experience was amazing. The girls were fascinated with our story and for us, Craig and I, it felt like life froze for eleven years in that place. We could recognize every corner, every window, every room and, even bring back passages of our flirtatious ways at those times. Ahhh!! The evolution of love, that is... One day we are dating, another day we are married. One day we celebrate Valentine's Day as a couple, another day we celebrate it as a full family. One day we bake cupcakes for our kindergarten kids and another day, we will be baking wedding cakes for them. It's all about love!! One way or another, love is an important ingredient in every single stage of our lives. I hope you all enjoyed a nice day of love and friendship, expressing your feelings in whatever way it makes you happy and full of joy. Pre-Valentine's weekend is here!! Time to wrap up, either attacking the stores and getting those gifts picked or staying home and, completing the details of your Valentine's affair... One important thing, most of the time left for the last minute, is the card accompanying the present. It should not be. Don't you agree? That is the part of the present in which you get to express your feelings and bare your soul, especially on Valentine's Day. So, let the heart do the talk, get your cards on time, and find some inspiration from these lovely picks. The favorite one for my other half is this one above, "Boy Girl Big Heart" from Fugu Fugu Press. Their designs are very artistic and original. As an added bonus, all of their cards are letterpressed, printed with soy based ink on paper with recycled content or 100% cotton, tree free paper... Awesome!! ...And these two for my girls, my birdie and my bunny. 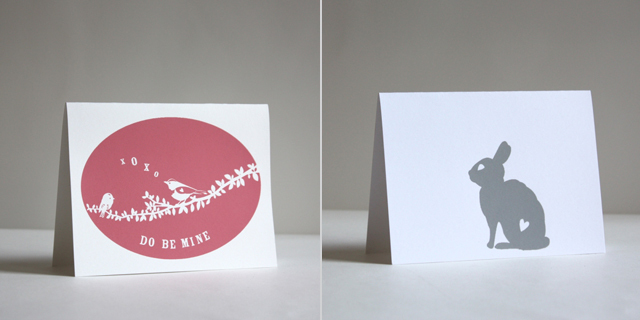 The "xoxo" and "Bunny" cards come from another favorite stationary and textile studio in New York, Foxy and Winston. The designs are all so whimsical and delicate, printed on 100% recycled or cotton paper... Adorable!! Have a wonderful weekend, everyone. 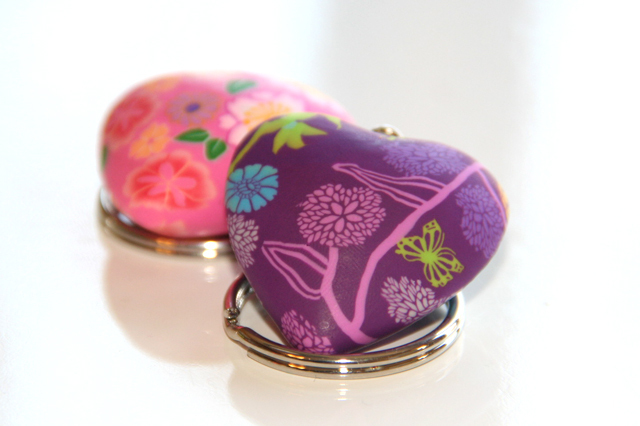 We will take some time to work on the girls' Valentine's cards and little gifts for school. Let's see what they come up with for their kindergartners and fourth grader friends. I'll leave you with some inspirational links to get your mood going on this Valentine's Day celebration. 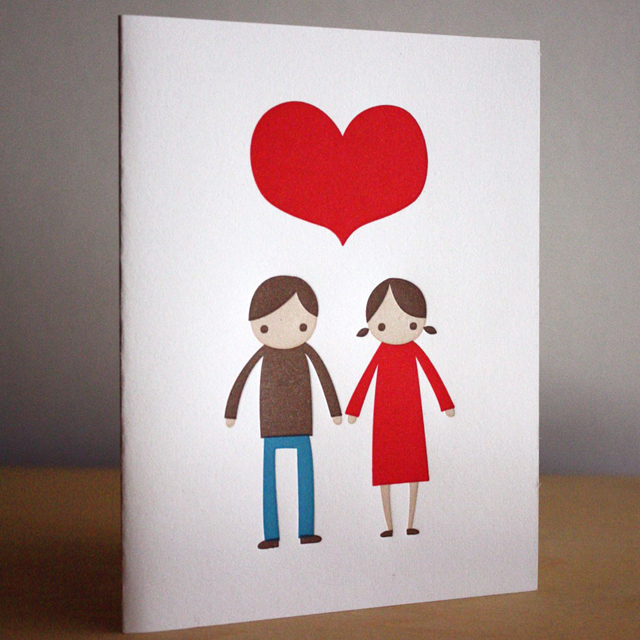 Boy Girl Big Heart card available here. Xoxo and Bunny card available here. 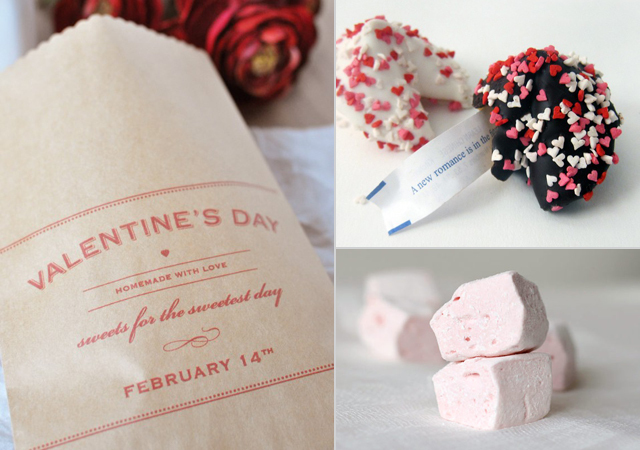 Simply Sweet Valentine's Day from Sweet Designs. DIY: Valentine Fortune Tellers from Design Mom. Valentine's Treats for Two from West Elm. Valentine's Day is just around the corner... 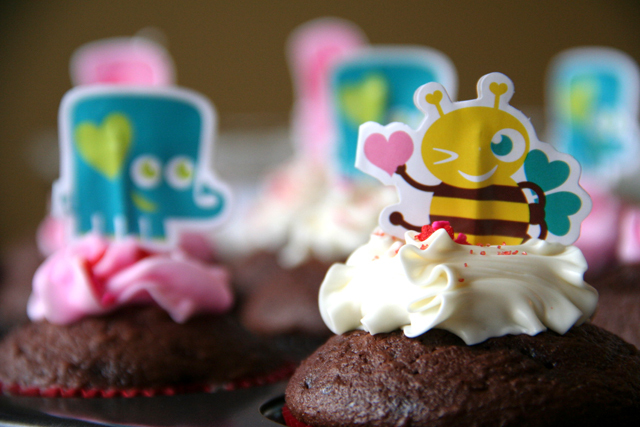 The selection of cute gifts for the mini ones is done and now, it is time to take care of the sweet stuff. 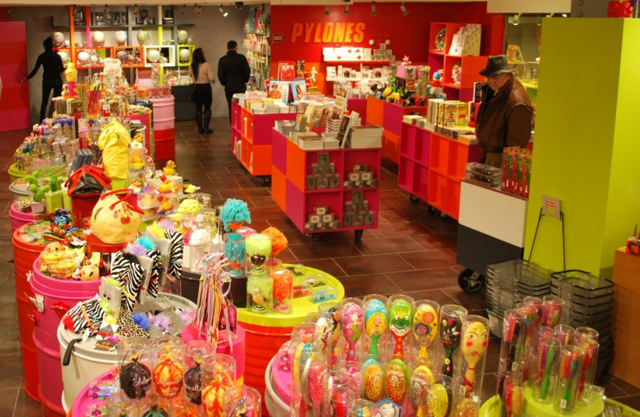 Chocolates, candies, lollipops, cookies, all of those so tempting and exciting for children but, such a problem for us, the parents. Dealing with a sugar rush is not fun or arguing about how many chocolates they can have at once, is not a conversation we want to have on Valentine's... It's all about love and friendship, and we want to make it a smooth, enjoyable occasion. When it comes to the sweets for Valentine's, I remind my girls that it is quality vs. quantity what really matters. Things clear then, I don't fill up a bag with chocolate kisses or get them a big heart full of red gummy bears. I prefer to look for something special, take a trip to the local bakery or the handmade chocolate store, which always have fresh, organic cookies and chocolates, maybe a little more expensive, but definitely worthy. Looking for a graphic way to put these thoughts together, I checked one of my favorite blogs Twig and Thistle and found this beautiful DIY Valentine's Treats Bag, a simple, easy idea with such a nice look. Right at the blog, you may download the file for free and print your own paper bags, fill them up with a couple of nice treats and that's it... You're done!! What's in my bag?? Two things that I'm sure my girls will love to devour, Chocolate Valentine's Fortune Cookies from Dylan's Candy Bar in NYC and Rose Vanilla Marshmallows from Whimsy and Spice, a Brooklyn confectionary that provides very creative goodies online or if you are in NYC, you may check their list of retailers. Valentine's Treats Bags available here. Chocolate Valentine's Fortune Cookies available here. Rose Vanilla Marshmallows available here. Celebrating baby's first Valentine's Day? ...That's kind of a tough one!! ... There is so much to look around, but you probably want to get the "one" special thing that your little bundle of joy could appreciate and keep for a long time... why not, forever? Something that you can tell a story about, some time, years from now. Here are some favorite things from around the web. 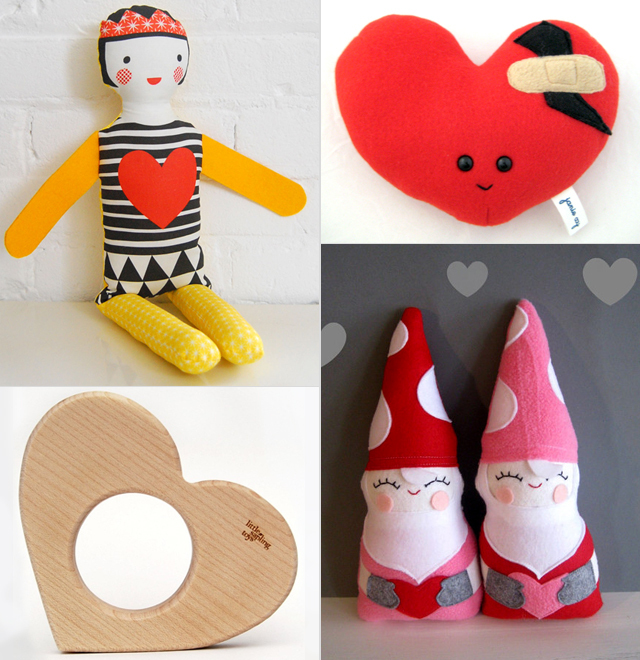 Cute stuff, made by hand using organic fabrics, hypoallergenic materials and even helping a good cause like the Children's Heart Foundation. In other words, little things that scream LOVE. Top Left :: Queen of Hearts Modern Doll from Petit Collage. Top Right :: Boo Boo Heart from Janie XY. Bottom Left :: Personalized Heart Teether from Little Sapling Toys. Bottom Right :: Red & Pink Valentine's Day Gnomes from Riley Construction. Helloooo!! I guess we are still on time to wish everyone a happy February, happy Groundhog Day, happy Super Bowl and happy pre-Valentine's preparations. The internet is packed with red and pink temptations everywhere... Cupids, chocolates, strawberries, even bottles of pink champagne are popping on my screen trying to "hook my heart", daring to buy my love. Hey!! I am not such an easy chick, but there are so many cute, gorgeous crafty things for little ones that I'm really finding it very difficult to resist. Case in place, this collection of onesies, tees, cardigans and hoodies from B Children's Wear. Talking about getting my heart hooked... Isn't that gray cardigan beautiful? Totally trendy with its gray background and just the right amount of red and black. Quite the outfit for his upcoming Valentine's Party at pre-K ...Want your boy to talk love? 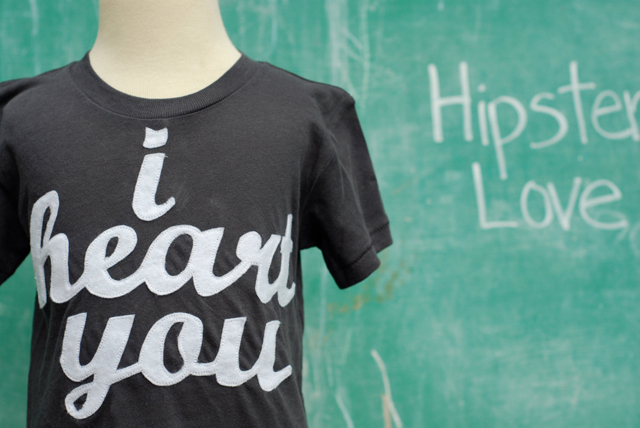 Check the "I Heart You" tee. 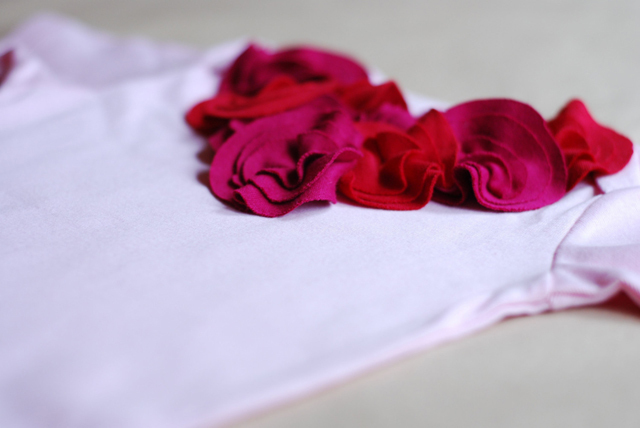 It speaks for itself... and my favorite in this collection, the "Flower Bud Heart" onesie, a delicate bouquet of red and deep pink felt flowers on a light pink onesie. Good for first time Valentine's and perfect for the rest of spring. B. 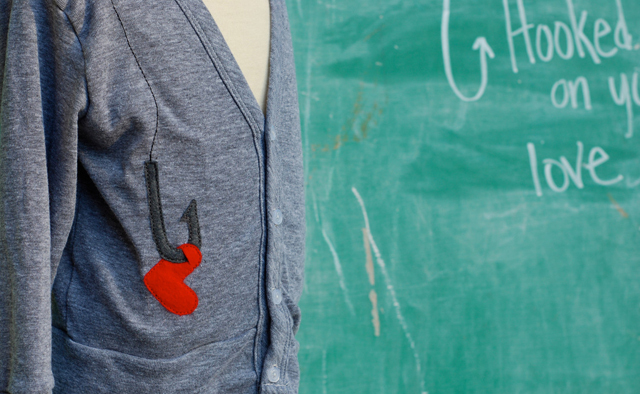 Children's Wear is all designed in Seattle, using soft cotton tees and recycled felt appliques sewn onto the shirts... Lovely! !